So what is the investment in “Investment” casting? The term “invested” is not often used this way today, but carries the historical meaning of “clothed” or “surrounded”. Investment casting employs a ceramic, plaster, or plastic shell that is formed around a wax pattern, into which metal is poured. The process utilizes a sacrificial pattern with the same details as the finished part, except that there is an allowance for thermal contraction (shrink). Patterns are typically made of wax using a metal injection die. Once a wax pattern is produced, it is assembled with other wax components to form the gate and runner metal delivery system. Depending on the size and configuration of the desired finish component, multiple wax patterns may be processed using a single tree. The entire wax pattern assembly is then dipped in a ceramic slurry, covered with sand stucco, and allowed to dry. Cycles of wet dipping and subsequent stuccoing are repeated until a shell of the desired thickness is created. That thickness is dictated, in part, by product size and configuration. Once the ceramic shell has dried, it becomes sufficiently strong to retain the molten metal during casting. The entire assembly is placed in a steam autoclave to melt away most of the wax. After autoclave, the remaining amount of wax that soaked into the ceramic shell is burned out in a furnace. At this point, all of the residual wax pattern and gating material has been removed, and the ceramic mold remains with a cavity in the shape of the desired cast part. This high temperature operation also increases the ceramic material strength and stability. In addition, it helps to minimize the reaction of the shell and metal during pouring. The mold is preheated to a specific temperature and filled with molten metal, creating the metal casting. Nearly any alloy can be produced using this process. Either air melting or vacuum melting may be employed as dictated by the alloy chemistry. Vacuum melting is utilized mainly when reactive elements are present in the alloy. Once the casting has cooled sufficiently, the mold shell is broken away from the casting in a knockout operation. The gates and runners are cut from the casting, and if necessary, final post-processing sandblasting, grinding, and machining is performed to finish the casting dimension-ally. Non-destructive testing may include fluorescent penetrate, magnetic particle, radio-graphic, or other inspections. Final dimensional inspections, alloy test results, and NDT are verified prior to shipment. Although most investment castings are small, the investment process has been used to produce castings weighing more than 1,000 pounds. That capability is limited to a relatively small number of investment casters and requires special handling expertise. Most cast parts fall in the ounces to 20-pound range. The process provides consistent and repetitive close tolerances along with intricate passages and contours. 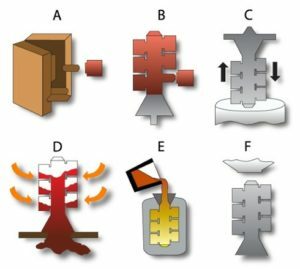 Many of these configurations produced by investment casting are impossible to produce by other means – where machine tools cannot reach, for example. Achieving net-shape or near net-shape cast components can dramatically reduce post-cast processing cost. Investment casting can be a good alternative to weldments or fabricating. Many components can be combined into a single casting. The more that are combined, the better the manufacturing efficiency. Converting multi-piece components to a single investment casting will typically deliver more dimensional accuracy and reduced part complexity. Because the ceramic shell used for investment castings is built around smooth patterns produced by injecting wax into a polished aluminum die, the resultant casting finish is excellent. A 125 micro finish is standard and even finer finishes are not uncommon. Furthermore, investment castings contain no parting line because only one mold is used rather than two half molds. Standards for surface blemishes are discussed and agreed upon with the customer based on the function and cosmetic requirements of the part prior to release of the tooling order. Typically, “standard” investment tolerances are considered to be +/-0.010” for the first inch and +/- 0.004” for each succeeding inch. Often, an initial conversation with the user during the design phase can result in a drawing for an investment cast part that substantially reduces or completely eliminates previous machining requirements to produce the same acceptable part. The cost of any part increases in proportion to the preciseness of its dimensional tolerance requirements – whether castings, machined parts, or fabrications. A close design review will often permit modification to tolerances, undercuts, blind holes, etc. to allow the higher production yields and lower piece costs by investment casting. If closer than cast tolerances are necessary, the machining required on an investment casting will still be substantially less than on conventional cast or fabricated components. Casting integrity is an important feature of the process. 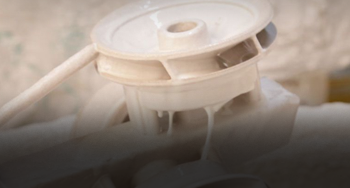 Investment casting has a long history of serving the most demanding sectors of industry such as gas turbine engine, petroleum, chemical, defense, and medical. Expected usage rates are a critical part of the calculation when selecting the right tooling option for investment casting. For low quantity requirements, investment castings may be more expensive than parts that are fabricated or cast using other methods if permanent tooling is pursued. For those applications, SLA or printed patterns may be a cost effective alternative – even for a quantity of one. Tooling amortization is a key factor to consider when determining whether investment casting brings the greatest value. The investment cast tool, a precision machined and assembled aluminum injection die, usually consists of multiple parts fitted together to produce the complex geometry of most investment cast components. This “front end” cost is not insignificant, but is often easily offset in a total cost analysis where the cost of unneeded subsequent machining and/or fabrication is excluded. As the only tool typically needed is for an injected wax part, tool wear is virtually non-existent. 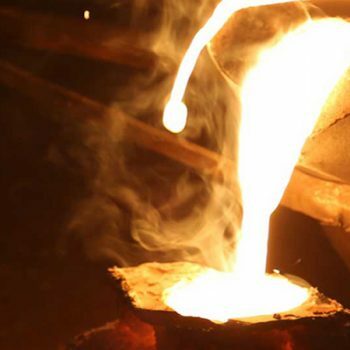 While it is possible to create investment castings in a range of sizes, there is an upper limit on that range that is less than other shaped technologies like sand casting. Very small structures: Investment casting is an excellent choice for thin-walled applications, but very small internal shapes that use cores can present processing challenges. Holes typically cannot be smaller than 1/16” (1.6 mm) or deeper than 1.5 x diameter. The multi-step investment casting process is more time consuming that other castings processes. But the entire process time to create a finished part can be shorter than alternatives because of the reduced need for additional machining. As with most materials and design decisions, a discussion with a metals expert can help drive the best decision. For new designs, that is a conversation that best happens as early as possible to optimize manufacturability. But even applications that have used metal components the same way for a long time can be evaluated to provide higher performance or a more cost effective conversion to a different process like investment casting.